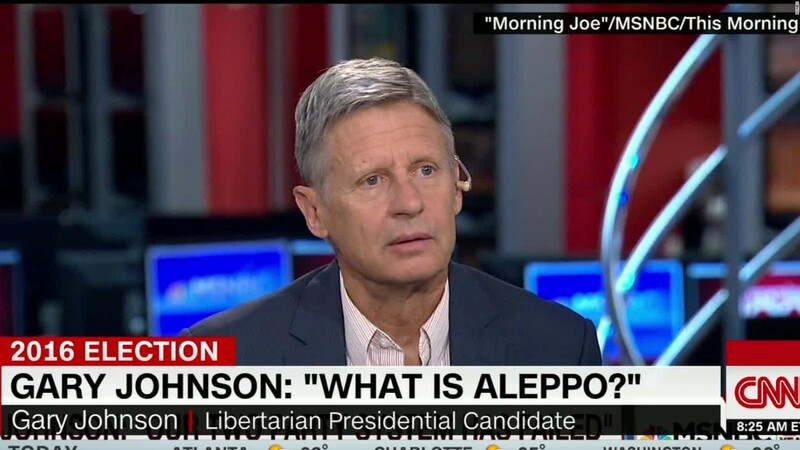 Gary Johnson is the leader of the Libertarian Party, a third party in the United States. Polls showed the party had 9% support a few days ago – before Mr. Johnson made a big boo-boo on nationwide television. When asked what he would do about Aleppo, he looked bewildered and asked the anchor: “What’s Aleppo?” Aleppo, you will remember, is Syria’s second biggest city and has been devastated in the country’s never-ending civil war. Tens of thousands of refugees have been fleeing the city and the country, heading mostly for Europe. It’s been big news – and Mr. Johnson was unaware of it! Sadly, there will be many others in the country who are just as ignorant of the rest of the world. From other scriptures we know that the Middle East and Europe play a key role in world events. Christians especially should be aware of what is happening in these two areas of the world, but too often they are not. Sadly, some just do not want to know. Mr. Johnson’s comment (or lack of comment) may have ended his presidential ambitions, which did not have much hope in the first place; but he’s not the only candidate aspiring to the presidency who is ignorant of international affairs. Donald Trump’s comments on NATO could mean the end of an alliance that has guaranteed peace for the West since World War II; while Mrs. Clinton’s assurance that America is the “indispensable” nation overlooks the fact that America’s preeminence did not begin until after World War II. Before that the world got along fine without the US and could do so again if the country pursued an isolationist course. Next week, Jean Claude Juncker, the former prime minister of Luxembourg and now President of the European Commission, the executive branch of the European Union, lays out his plan for a European military. The British were very much against this, seeing it as a threat to NATO. But the British are no longer members of the EU. The remaining 27 members of the Union are now free to pursue their own combined military force, which has the potential to rival America’s. The EU remains, even without the UK, the world’s biggest economy and, through trade, has greater economic power around the world than the US does. Inevitably, an EU military force will be led by Germany, the most powerful economy in Europe. “A nationalist, anti-immigration party performed strongly in a state election Sunday in the region where German Chancellor Angela Merkel has her political base, overtaking her conservatives to take second place amid discontent with her migrant policies. The three-year-old Alternative for Germany, or AfD, won 20.8 percent of votes in the election for the state legislature in Mecklenburg-Western Pomerania. Merkel’s Christian Democrats polled 19 percent, their worst result yet in the state. The successful vote for Brexit in the UK in June was motivated partly by anti-immigrant feeling. AfD’s success in Germany is due to the same problem. Next year’s federal elections in Germany are likely to reinforce the trend. In France next year a victory is predicted for their anti-immigrant party. The US may see the same in November. Voters throughout the western world are waking up to the twin threats from globalization and immigration, which together threaten their way of life. At the same time there are increasing fears of further terrorism from radical Islamists. Europe is being invaded by hundreds of thousands of potential terrorists, mostly from ISIS areas of influence. Could this be the push by the king of the South as described in Daniel 11? The only way to stop this invasion may be for the new European Army to invade the Middle East and stabilize the failed states of Syria, Iraq and Lebanon, as the King of the North hits back. The changes in Europe will affect the Middle East, the home countries of many of the recent refugees arriving at European borders. The Visegrad Group is made up of four eastern European countries, Poland, Hungary, the Czech Republic and Slovakia. These four are against the massive immigration that has been favored by Angela Merkel. The four are working together to prevent further invasion from the Mideast by Islamic “refugees,” many of whom, it turns out, are actually from west Africa. Could these four countries be the nucleus of the eastern leg of the revived Roman Empire prophesied by the prophet Daniel in chapter two of the Book of Daniel? The developments listed above all have two things in common – I have heard nothing about any of them on the main American television news programs. They are not considered important. The US election gets priority. Secondly, they are all of significance when it comes to biblical prophesies relating to Europe. Christians can be forgiven for being ignorant of them. Having said that, Aleppo has received some attention on national news programs. Clearly, not everyone wants to watch!